Neighbor Forums in the News, 9 New Forums, Reaching Millions? was written on March 8, 2010 and filed in All, Issues Forums, Minneapolis - US, Neighbor Neighbourhoods, New Efforts, Participation 3.0, St. Paul - US, UK, US. Neighbor Forums in the News, 9 New Forums, Reaching Millions? Our Neighbors Forum adaptation of our Issues Forums model is taking off. Neighborhoods next to our established forums are asking, “Hey, what about us!” New volunteers are stepping forward. The full story, especially our special Inclusive Social Media efforts in lower income, highly diverse/immigrant neighborhoods, is covered by a recent Twin Cities Daily Planet article. The quotations from participants are especially moving. The people who participate are what makes this work so powerful and rewarding. Thank you. With our newly funded efforts (thank you to the Ford Foundation and the St. Paul Foundation) we’ve recently brought Boa Lee on as our Community Outreach and Information Leader for our St. Paul Frogtown effort (she is joining Marny Xiong who led our recruitment last summer and is helping monitor local news for the forum while back at college). An outreach leader will be joining us in a similar outreach role for Cedar Riverside in Minneapolis. We will likely open another contract position (up to five hours a week) for Cedar Riverside in the Spring. Ravi Reddi, a Community Technology Empowerment Americorps volunteer, with the Brian Coyle Center’s computer lab as adopted Cedar Riverside as his civic engagement project. 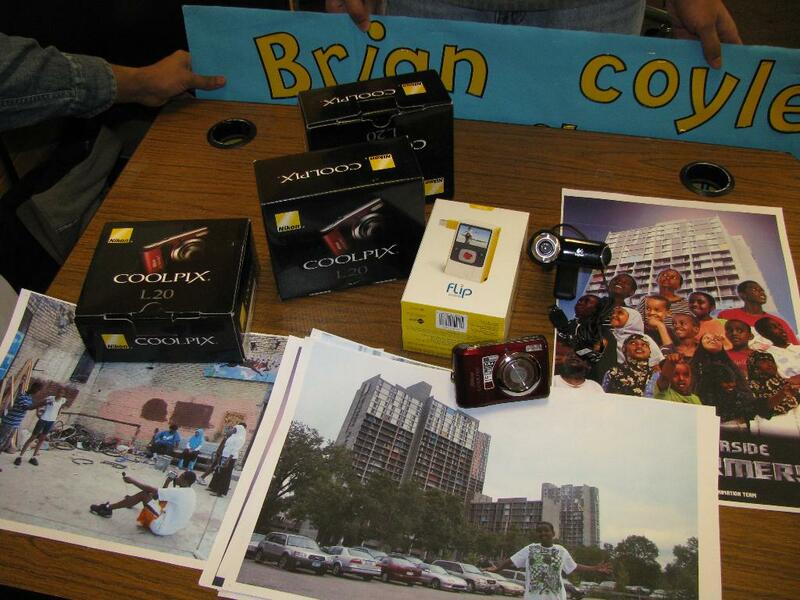 Ravi is helping promote a “Day in Life of Cedar Riverside” style youth digital photo and video project with the forum. 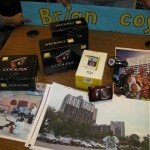 We’ve loaned three cameras, a video FlipCamera, and a webcam to the Center. Later in the year, we hope to have a photo or video of the day to share with the community via the forum from neighborhood youth. Thanks our dedicated volunteers and previous funders (the Minneapolis Foundation and the Knight Foundation’s St. Paul donor advised fund) this effort is growing in strength and interest. Inclusive outreach takes real resources. While these funds were focused on two neighborhoods (and the new St. Paul Foundation $10,000 grant will in part support outreach later in the year for the East Side of St. Paul) they set the foundation for the establishment of all our existing and start-up neighborhood forums. All of these neighbor forums need your help to reach the required critical mass. Whether it is hanging posters at coffee shops or signing people up in-person at community events, there is no substitute for real on-the-ground outreach. Across our network, we know of not one single effort where “build it, they will come” worked. So get out there and recruit people one by one to reach the 100 members required to fully open a new forum. We pay someone (with money from your donations) to do the data entry because we want you to get out there with no hesitation. Our blog shares lessons on new efforts, these slides/webinar goes in-depth (on our general Issues Forum model which you need to adapt to the big “C” community instead of big “P” politics on our big city forums), and our wiki has a mess of self-help advice. Don’t see your neighborhood listed above? If you are ready to volunteer as the Forum Manager, we can set you up in minutes. The more the merrier as we gear up to launch some city-wide outreach. Contact us with your neighborhood/area and a bit about your background. If you are a neighborhood association or district council ready to do some outreach, we are experimenting with start-up forums that will open once a volunteer Forum Manager (and 100 initial members) step forward. There must a local resident willing to volunteer as the leader (we support them and connect them with other leaders) to succeed and be truly community-owned. The transition to “neighbourhood” level activity actually started with our E-Democracy.org UK efforts. After our two initial pilot council-wide (supported with UK government funding) forum, we were approached by the local governments in Bristol and Oxford about trying the model at the neighbourhood level. Except in Headington where the launch leveraged the connection of a long-time neighbourhood connector, all of these forums would benefit significantly from a new round of in-person outreach. While our city-wide Issues Forum model remains quite unique (it is very different from anonymous online newspaper comments), at the neighborhood level, our “network” approach is joining ten of thousands of individual neighborhood e-mail lists, place blogs, Ning networks, Facebook Groups, etc. that operate in isolation. That said, according to the Pew Internet and American Life Project, some 4% of American adults say they belong to a “neighborhood listserv.” That is 8 million people. To us, that is a great starting point. If each list averages 250 members, that means over 30,000 people have stepped forward to connect their neighbors online (and as far as we can tell, few of them know each other or of similar efforts next door). Based on our mission, we do seek to raise the amount of civic engagement and social inclusion in these forums. While “who can recommend a good plumber?” is completely legitimate neighborly communication, we work to leverage the attractiveness of these forums to introduce local public issues, promote government transparency (and information use), and public participation at all levels. More importantly, our sense is that most of the online groups serving neighborhoods are NOT in lower income, more diverse areas and these areas are clearly being left behind. This must be addressed. Our inclusion efforts are embryonic and extremely rare. Looking forward, we want to help “move the field” and double the number of people on such networks to 16 million people. We can cover perhaps 20 to 40 thousand people in a few years. Who will bring in the rest? Will it be you? One neighborhood at time? Or some other approach? Our friends at the Front Porch Forum in Vermont (check out this great article), NeighborsforNeighbors.org in Boston, and i-Neighbors research project are part of a family of other “network” projects exploring how to connect people who live near one another online each with various nuances. (See our wiki for an extensive collection of social media in local public life links.) These projects are on to something. It is a big world our there with lots of room for different models. To us, the biggest gap is the lack of a dynamically up-to-date and comprehensive geo-coded directory of these local two-way spaces online (we are exploring possible partnership ideas with mySociety.org’s GroupsNearYou.com site, but that site is “manual” so to speak). If we can’t promote where to find these local sites nationally, it is nearly impossible to find them online for your area. Word of mouth is the only option and extremely limiting. To help move the field, we are first working to connect the field through a simple online community for those who host similar effort at the neighborhood level online. Sound interesting? Join Locals Online and get ready to sign our draft invite letter. As a non-partisan “civic engagement” project, we see these community forums as the highly engaging and attractive “community life” online path that will help us introduce the next generation of local online civic engagement to a critical mass of “e-citizens.” As our new forums are promoted and launched, in addition to building the social fabric of our communities, we will also be able introduce broader local civic opportunities to participate in our new Participation 3.0 initiatives. Most e-democracy projects fail based on the lack of outreach and participants. Our existing and growing network gives us a chance to try new ideas quickly. We can fail fast and try new ideas cost-effectively until we figure out what works. While many individual neighborhood forums are private and restricted to residents, ours’ are designed to be open to all. Being public gives you a voice. It gives you power and the ability to help set the agenda in your community. That said, we do see a space for semi-private or mini-public “nearest neighbor” networking online that is well outside the glare of Google search. We see a need for “public life” social networking that is not just about chatting with your friends and families on Facebook in private life. We highlighted our geek-led volunteer-based Neighborly exploration in last month’s e-newsletter. On Saturday, we had our third code-a-thon and the next one is planned is planned for the afternoon of Sunday, April 11. Join our online working group to get involved. Neighborly is an experiment. If it works, starting in Minneapolis and St. Paul, the combination of semi-private nearest neighbor “circles” online covering a couple block, public neighborhood forums covering 5-15,000 households, city-wide Issues Forums covering whole cities, and new Participation 3.0 features (like public meeting agenda alerts and comments) we will establish the world’s most active and dynamic local online environment for community engagement, participation, transparency, and collaboration to date. Now that is exciting. 2 Comments on Neighbor Forums in the News, 9 New Forums, Reaching Millions? Add a comment to the blog post Neighbor Forums in the News, 9 New Forums, Reaching Millions?